VIT was established under Section 3 of the University Grants Commission (UGC) Act, 1956, and was founded in 1984 as a self-financing institution called the Vellore Engineering College. The Union Ministry of Human Resources Development conferred University status on Vellore Engineering College in 2001. VIT was established with the aim of providing quality higher education on par with international standards. 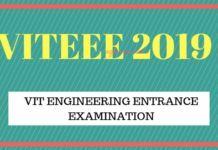 VIT was conducting engineering entrance examination for VIT University B.Tech admission. It has been held at all India level in 124 cities. The score of the exam will be considered for admission in VIT Vellore, Chennai, Bhopal, and Amravati Campus. The candidates who will qualify the exam, will have to appear for the counselling on the scheduled dates. 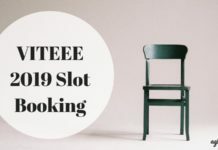 Candidates can check all the important detailed about VITEEE syllabus, exam pattern, cut off and more from this page. Candidates can also visit to official website vit.ac.in. of VITEEE for more detail which is provided below in this page. Candidates should prepare according to the syllabus of VITEEE . Through the syllabus, the candidates will know the amount of time and effort to be given to each chapter. 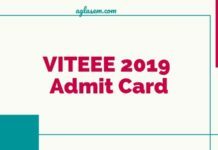 Candidates can use the link below to check VITEEE syllabus for Physics, Chemistry, and Mathematics. What is the fee structure of vit University without concession pls reply……. Please scroll up this page to check the fee structure. Currect Year’s Cutt Offs will be released later but you can get the estimation from previous year cut offs & Current Years Expected cut offs . Sir why the councelling at Bhopal has been stopped for the admissions for 2017if it is the most convenient place for North Indians VIT should be able to manage the crowd .It is really very disappointing .Please look into this matter. i have done online registration and i have sent my application form along with the required annexures. What should i do further to enter the college ?